Back at the beginning of March, when the first lambs were born, we began to notice a Kestrel in and around the farm. As the weeks went on he became more and more apparent, most nights he would be roosting in the Lambing barn and when I turned the lights on at night he would fly around disorientated by the bright lights. My wife then noticed him in the Owl box that we have on the outside end of the barn. The box is designed to attract a Barn Owl, but as yet has only been used as a roost for a passing Pigeon. At some point we realised that the Kestrel had a mate and as the weeks went on, they spent more and more time in and around the Owl box. We were optimistic that they were nesting there, but as the months went on there was no sign, or sound from any young and as we’d often see both birds out flying in the evening, we ‘d given up hope of a successful breeding this year. 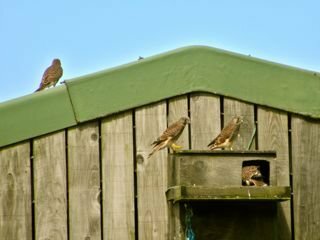 But last week the distinctive sound of Kestrels calling, caught our attention and we were delighted to see 4 kestrels chicks sitting on the ledge of the Owl box, testing their wings and later in the day taking their first flight. With Kestrel numbers on the decline in the UK, it’s great to see 4 young healthy birds fledging, they still have a long way to go until they learn to feed for themselves, but it’s great start. So my only decision now is whether to put up a sign on the front of the box for next spring ‘OWLS ONLY’ ! !